Dedicated exclusively to the history of one of the most remarkable projectors of all time; the DP70. Jan Jacob Kotte with a prototype DP70. Philips Newspaper clip, 1956. 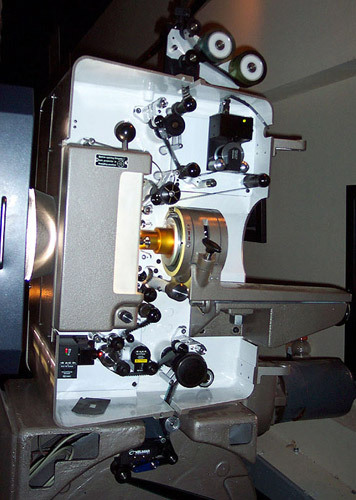 The birth of the DP70 projector dates back to October 1952 and the beginning of the Todd-AO process. 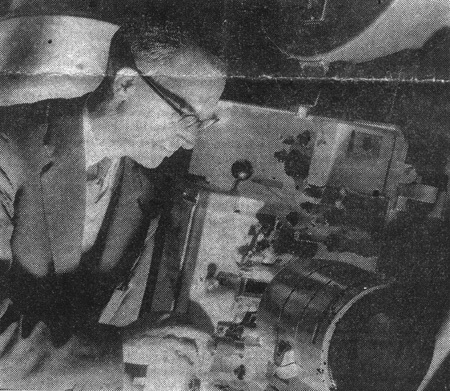 Michael Todd, not satisfied with technical limitations of the Cinerama process, he formed a company with some investors, including Rodgers and Hammerstein II, Joe Schenk and George Skouras and named it MAGNA. The purpose of Magna was to develop a new wide screen process. Magna Theatre Corporation commissioned American Optical company to develop the system which was named Todd-AO. "TODD-AO film, plus the TODD-AO camera, plus the TODD-AO "all-purpose" projector, plus TODD-AO Orthosonic sound, and the great, arced TODD-AO screen equal clarity of perspective, delineation, and color reproduction. But, most important with TODD-AO, audience participation now has its fullest expression." For Todd-AO a new projector was required. Unable to make one in-house, American Optical Company asked several US projector companies to build a new 70mm projector. None of them, however, believed a completely new 70mm projector could be ready in only 9 months as required. In September 1953 Magna Theatre Corporation approached Philips Cinema, a division of Philips Electro Acoustics division (ELA) in Eindhoven, Holland. Dr. Brian O'Brien, AO heads of Research and Development knew a tremendous number of people and he was well aware of Philips projectors and their reputation of excellence. Headed by Philips Cinemas chief designer Mr. Jan Jacob Kotte (Note 6) Philips Electro Acoustics division (ELA) was asked to manufacture a multi purpose projector suitable for all 70mm and 35mm formats. Kotte and Philips knew it would be expensive, and Magna Theatre Corporation had to buy 50 machines (For the 25 Todd-AO installations) in the first order (Note 11). 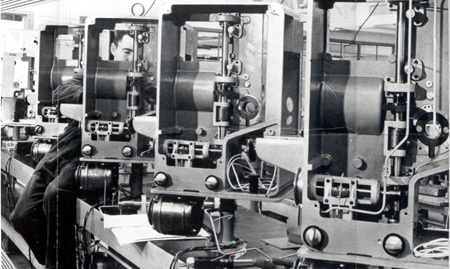 In 1953, Philips Cinema was also very busy making new equipment for CinemaScope. William (Bill) E Peck of American Optical Company and Jan J. Kotte, jointly designed and built the projector from ground up in only 9 months as required by Magna. It was a revolutionary projector and so versatile it could show any film format except horizontal double frame VistaVision. The DP70: "...changeover from 35mm to 70mm will be accomplished by flicking a switch and twist one or two dials. It will be unnecessary to interchange film movements, gates etc" (Note 9). The final version, however, did require change of gates, pressure bands etc. Jan Kotte worked day and night with his colleagues and even went as far as installing a home-office with a large drawing board. Completely unheard of in 1953/54. Towards the end of 1954 the first set of three DP70 pre-production models were delivered to Magna Theatre Corporation and pictures began to appear in magazines. By February 1955, "Oklahoma!" was expected to open in early May 1955. And by April 1955, the opening was expected to be on July 17, 1955. They design was a little different from the following machines. Interestingly, the mechanism door was mounted on the left side of the mechanism (door opened right to left). The interior was not painted white, but rather in the Philips Hammer tone Epoxy paint finish like the rest of the machine. Prototypes did not carry serial numbers. Prototypes are here referred to as pre-production numbers X1, X2 etc. Although not an original installation, the two DP70 prototypes are still being used at Todd-AO Stage #2 in Hollywood to this day. More than 50 years after delivery from Philips in Holland! All projector mechanisms were made in Holland in series of 100 at a time. (Source "In the Splendour of 70mm", by Grant Lobban). 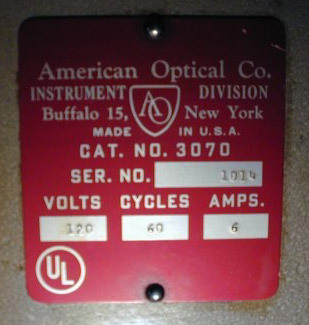 Other projector parts (lower base, upper base, spool boxes, mounting table for lamp house) were also made in the United States by American Optical Company and are clearly noted: Made in Buffalo, New York. In the US brochure dated S-61 (probably 1961) parts were made in Mount Vernon, New York. Projector parts made in the USA carry a serial number on the upper base with a production year and a production number. An example is 59-175. Later models only carry a 4-digit serial number. In the fall of 1955, 50 DP70 projectors were shipped from Holland to the United States for the Michael Todd Company, Inc., just before the opening of "Oklahoma!" on Broadway October 10, 1955. 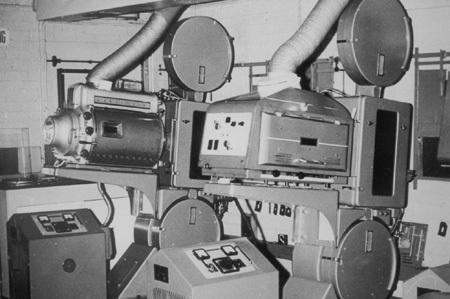 Those 50 machines were numbered from no 601 - 650 as the first machines (Some projectors were marked "Property of the Michael Todd Company, Inc"). Usually there were 2 machines in a projection room. 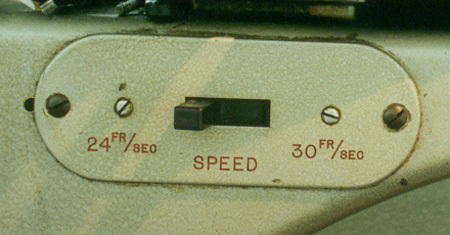 A left and a right projector (as seen from the rear of the machines toward the screen). But in some cases 3 and 4 machines were needed. A 4-projector example is the Palais de Festival in Cannes and Musee du Cinema in Paris, both in France. Today it is not unusual to find a 1-projector installation. The DP70 also works with platters (non-rewind/cake stands) and towers. By the time of Photokina Exhibition (29.09.1956 to 07.10.1956) in Cologne, Germany there were 21 Todd-AO cinemas in the US. 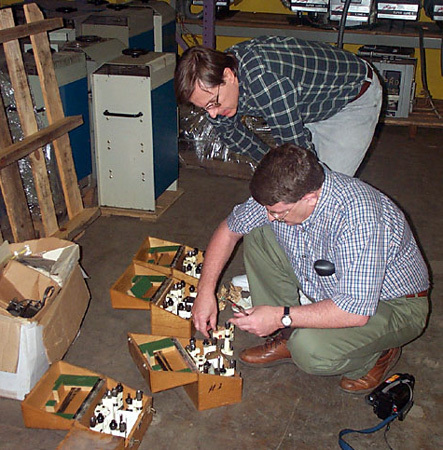 Todd-AO installations in the US were planned and carried out by The Todd-AO Corporation. 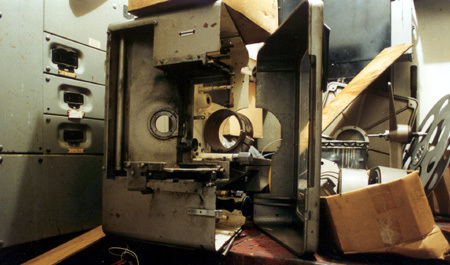 The speed of installing Todd-AO equipment in the US took of slower than expected due to the lack of film in the Todd-AO process. In 1957 there were 60 Todd-AO installations and Germany, Italy, Malta and Japan were about to get Todd-AO. By 1958, there were 10 DP70 installations in England and by January 1960 there were 34 cinemas (19 CMA and 15 ABC) in Great Britain with the DP70. The number of Todd-AO installations had risen to 86 in the US and Canada alone by 1959. 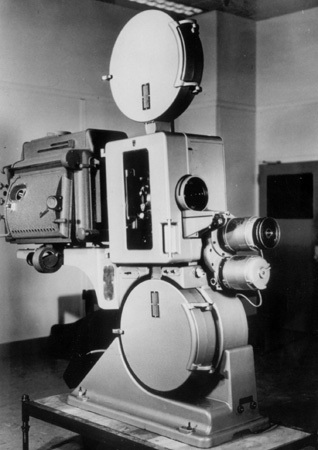 By August 1960 the DP70 was installed in 231 venues = 462+ machines (US and rest of the world). By OSCAR Night, in March 1963, there were 525 DP70 installations (= more than 1050 machines) in 39 countries. Another source says that on 15.04.1963 there were 450 DP70 Todd-AO installations all over the globe. 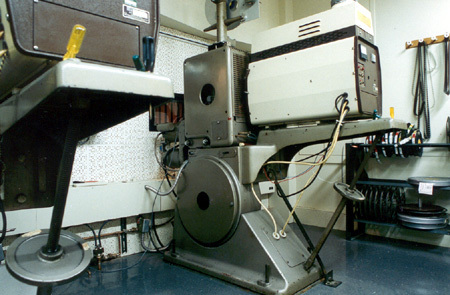 Other 70mm projector manufactures were: Bauer, Cinemeccanica and Century. By December 1964 more than 1100 cinemas worldwide had 70mm installed. Most of them were with the DP70. During the 1966 Photokina exhibition (in Cologne, Germany), Philips Cinema presented the new DeLuxe Projector for 35/70mm, widely know as the DP75 and manufacture of the popular DP70 had finally come to an end. The DP70 was a very expensive 70mm projector to install. Thanks to Stefan Scholz, Craig Binnebose and hans Frahm it is now possible to add the original price of a complete machine. The price of a complete Todd-AO installation at the Savoy in Hamburg, Germany. The first purpose built Todd-AO cinema in Europe. This one from Craig Binnebose: The Cecil Theatre, Mason City, Iowa. Two DP70 cost USD $6225.00 each. August 10, 1966. Quotation No. 447 from Ballantyne of Omaha. Philips originally named the new machine the EL4000/01 in their catalouge, but it quickly became the DP70. 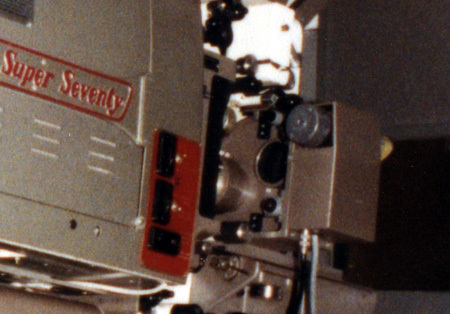 The DP is short for "Double Projector" and the "70" meant it was designed specifically as a 70mm projector. With a handy storage case with all necessary parts for 35mm film, change over from 70mm to 35mm could be done in less than 4 minutes. In the United States it simply became the "Todd-AO projector Catalogue 3070". Later the name was changed to "Universal 70/35" and finally from 1963, it became the "Norelco AAII". AA was very likely short for “Academy Award”. II meant “Version 2” because of the many new changes and improvements introduced to this model after winning the OSCAR. Philips Cinema and Jan Kotte nicknamed the projector the "Dollar Princess" because they made a considerable amount of money developing it for Magna Theatre Corporation. It is interesting to note that in the state of Victoria, Australia, it was known as EL4000 and in the state of New South Wales, also Australia, it was know as DP70. 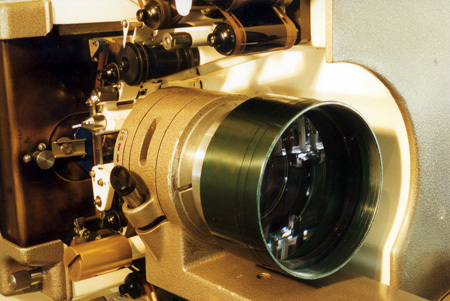 The Todd-AO projection lenses, known as Cine-Aperagons, were specially designed by American Optical Company for each cinema (so the pres said) with aspherical surfaces on some of their elements. They were very sturdy and heavy lenses. The pair used in Copenhagen almost "painted" an extremely sharp 70mm image on the curved 17 meter Todd-AO screen. Always in focus, great contrast and very bright images. In the early 1960s Philips Cinema was one of the worlds largest Cinema Equipment supplier and Jan J. Kotte's projector quality was unrivalled. The DP70 was the crown jewel in a long line of Philips machines that include: FP4, FP5, FP56, FP20 and FP30. How many 70mm projectors will allow one 70mm print 1600 passes? That was the case in London and the Dominion Theatre's record breaking "South Pacific" 4-year run. One Todd-AO print was shown from 21.04.1958 until 30.09.1962 London. 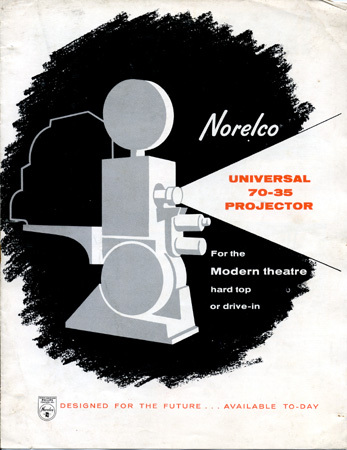 "The design and engineering of the Norelco Universal 70/35mm motion picture projector". 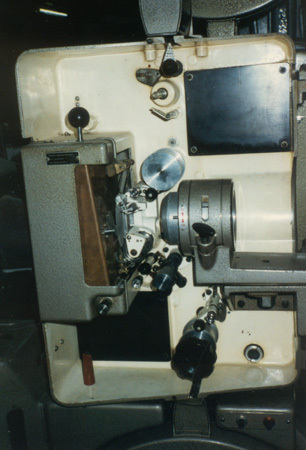 “it´s unique design provides for rapid conversion to either 70mm or 35mm projection and for operation with significantly reduced film wear and damage”. Actually there were two OSCARS made. 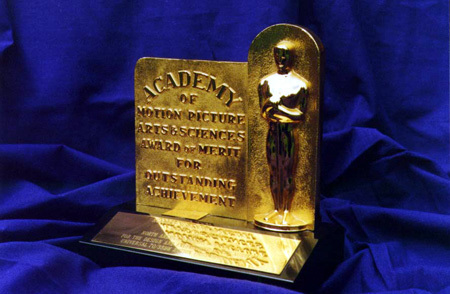 The original OSCAR was was awarded to the Philips Company and brought back to Europe by Mr. Nijsen, who was head of Philips Cinema's publication department. The Philips company ordered a second OSCAR for Mr. Jan Kotte personally in appreciation of his dedication to Philips. 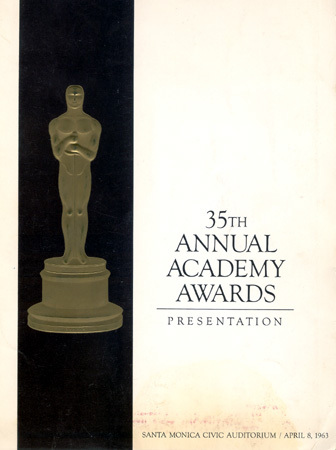 The 1962 Award (given in 1963) was the first ever given to a projector in the Academy's history. In 1999 the IMAX projector, with the unique Rolling Loop principle, was also awarded a similar award. At that time (OSCAR Night) there were 525 DP70 installations (= more than 1050 machines) in 39 countries. The OSCAR was well deserved. The DP70 was and still is the "Rolls Royce" of 70mm projectors. 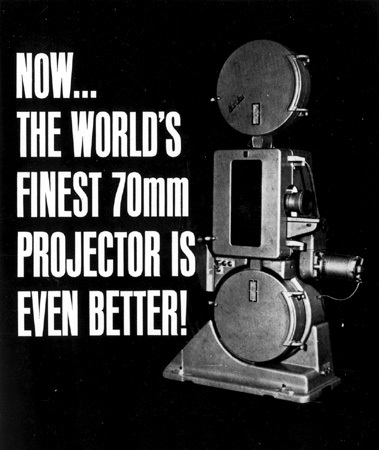 Later that same year Philips Cinema received the largest one-time order for the DP70: 100 projectors to one projector company in the United States. A few days later another order for 50 projectors came (Note 11). • Fully compatible with, and quickly convertible for 70mm or 65mm film with up to six magnetic sound tracks, 35mm CinemaScope with four magnetic or single optical sound tracks, and Perspecta-sound, Wide Screen film of any aspect ratio with either magnetic or optical sound and standard 35mm film. • Scientifically compounded curve of light gate - prevents film buckle. • Single blade double speed conical shutter, providing highest light transmission of any projector. Leading and trailing edges have integral air scoops that aid in dissipating heat. • Two independent motors on each projector, 24 and 30 fps- all past, present or contemplated 70mm films can be projected without additional expense or modification. • Combined ten-track magnetic clusters, no tricky threading required when changing from six- to four track reproduction. • Triple filtered metered lubrication system. • Substantially constructed for rock steady projection. • All modern, domestic high-power arc lamps adaptable without loss of efficiency. 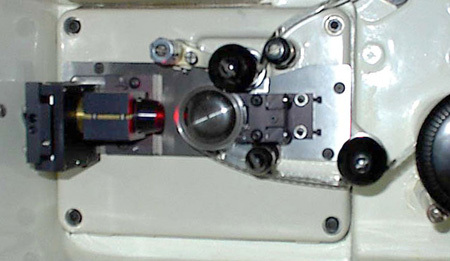 • Lathe bed lens carriage, positive alignment of lens to film path. • Factory installed internal wiring, reduces installation costs. • Adjustable for all projection angles - from 28 degrees downward to the upward angles required in drive-ins. • Complete stock of replacement parts always available. • Fully Underwriters' Laboratories Approved. • Dual split 70/35 magazine shafts. Standard 5" hub 35mm reels useable. No longer necessary for theatre to purchase special 35mm reels with 70mm flanges. • New non-glare Plexiglas observation window in projector door. • New threading guards on magnetic shield and idle roller. • New improved intermittent assembly. • New oil vapour leak protection. • Simplified built-in water cooling circuit. • Heavier main drive gear set. • New single motor drive. • New 2-speed clutch for both 30 Frames/sec & 24 Frames/Sec film speed with double "V" belt drive. • New reduced torque motor. • New 4-pole motor start contactor. • New easy installation lower compartment door. • New cast aluminium lamp house bracket with adjustable slide for easy alignment of lamp. Provides means for moving lamp without necessity for realignment. 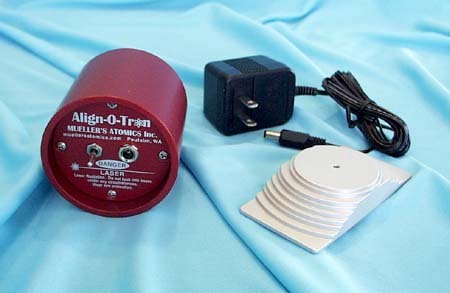 Eliminates need for purchase of special adapter previously required for lamps. • New spiral gear take-up drive. • New graphite impregnated nylon idler & pad rollers. • New pre-wired magnetic cluster block. The DP70 is not made for automation, remote control and multiplex operation. So with increasing demand for cost saving, theater managers started to break up cinemas into several screens and cut down on projection staff. There was a need for cinemas to be automated. In the late sixties Rank Film Ltd. in England became distributor of Cinemeccanica's projectors. 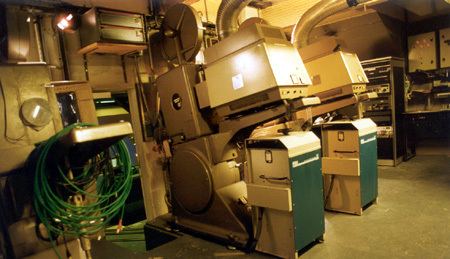 DP70s were removed in more than 20 ODEON cinemas and replaced by the popular Italian Cinemeccanica Victoria 8 70mm projector. The Cinemeccanica Victoria 8 can be fully remote controlled. A VERY expensive action by Rank facing the increasing competition. Some of these DP70s went to the United States, but most of them was scrapped only after a few years of service. Much to the frustration of many projectionists and DP70 devotees. 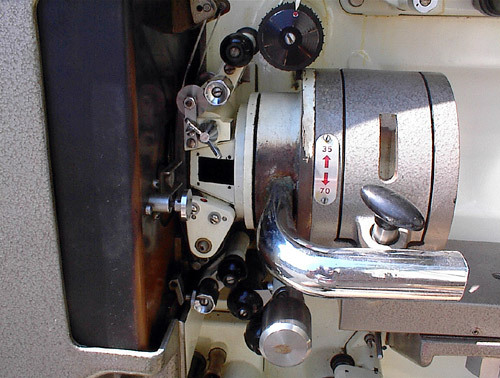 There are reports that many ODEON DP70s were literally scrapped with a large hammer [Source: Dion Hanson]. The reason for this is unknown. A similar thing happened in Australia when Hoyt's theatres, a large cinema chain, automated all their cinemas. Those DP70 not needed were given away to those who were interested. The rest were thrown away into the Tasmanian Sea or even used as boat anchors in Sydney harbor! *). There is no evidence of this statement. But as theatres were closing in the 60s and 70s a lot of theatre owners had the problem of disposing of equipment that had no resale value, and the DP70 had not reached the cult following that it now has, so many were simply thrown out. It is interesting to note that Hoyt's in Australia did not buy another Philips projector for about 10 years after DP70 production ceased. During this time they bought Cinemeccanica Victoria 8s. In 1976 Hoyt's again began to buy Philips machines mostly FP20s but some DP75s for new locations. From South Africa there are reports of an actual burial of a DP70! Back in England, the ABC cinema group also replaced some DP70s with the brand new DP75. 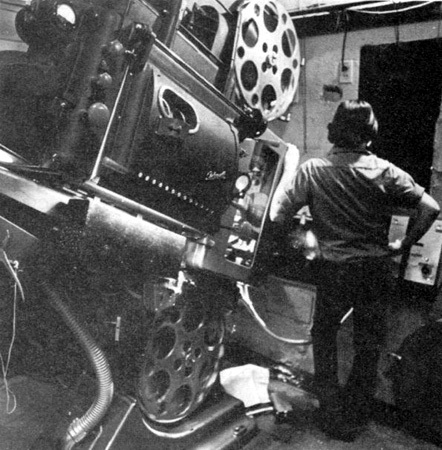 Most DP75 installations were set up for the 70mm presentations of “Doctor Zhivago” (in 1966). Many DP75 installations were new 70mm installations. Some ex-ABC DP70s went to the United States. In the early 1990s some DP70s were still maintained by Steven Krams and his company in Florida and he had at least 20 machines in stock. The DP70 also inspired at least three different 70mm machines, which have striking similarities with the DP70. 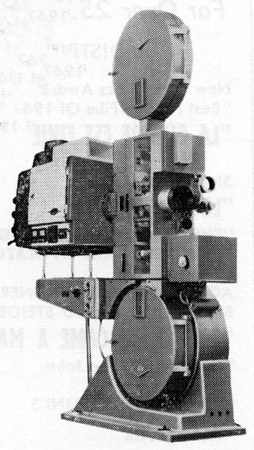 The Toshiba Photo Phone Co., Ltd. in Japan introduced their TP 70/35 Imperial projector (Motion Picture Almanac 1972 page 64A). 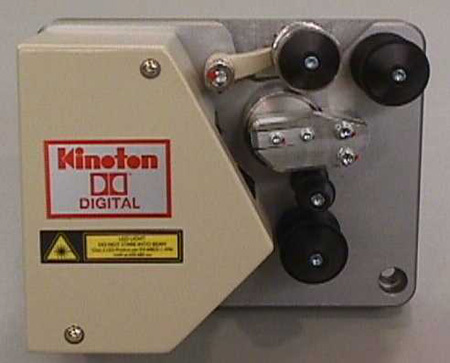 Spool boxes, lower- and upper bases were more or less identical to the DP70. 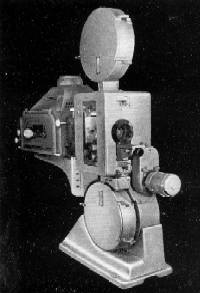 Another interesting DP70 "look-a-like" projector was the Russian KTT15-A. This projector does not look like a DP70 at all on the outside. Inside, however, some striking similarities were apparent. The lens mount bracket, 70mm film gate and the shutter were a very close variation of the DP70. Theres also the Incol 70-35 from Brazil where the film gate have some similarities with the DP70. In recent years, the price for a DP70 has somewhat dropped. Many DP70 projectors have found a safe home in the hands of DP70 devotees who restore them to original glory. Some people even strip them and have them completely repainted in the original Phillips Hammer tone Epoxy paint. However hard it may seem, 70mm projection and 6-track stereo in a private theatre in the basement is not uncommon. 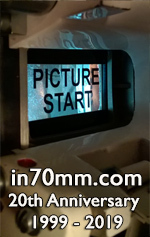 It is not only film collectors and projectionists who appreciate the DP70. 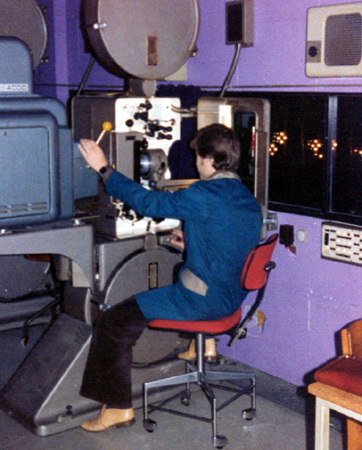 Many prestigious cinemas, laboratories and film studios like Technicolor Ltd., 20th Century Fox, Warner Brothers and Paramount Pictures in Hollywood have several DP70s in the their screening cinemas. Todd-AO in Hollywood have 6 projectors and Paramount Pictures at 5555 Melrose in Hollywood runs at least 5 machines. 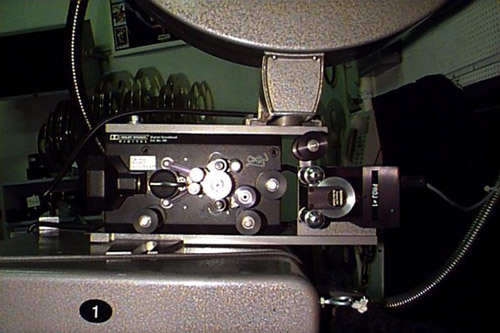 Film museums in Amsterdam, Oslo, Stockholm, Paris, Bradford, and Hollywood, also install the DP70. And with good reason, as the DP70 remains to be the "Rolls Royce" of 70mm projectors. A large number of DP70s are still running today, nearly 60 years after the first one came of the assembly line in Eindhoven, Holland. A well kept DP70 will (probably) never fail in operation. The DP70 is a beautiful projector, outstanding craftsmanship and a piece of contemporary art from the 1950s. By 2012 and onwards, digital projectors are finding their way into projection rooms across the world, and many machines are simply given away, cannibalized or thrown away. Also editor of ELAgraph. Left ELA 1968. Sales company for A.O. projectors in the US. 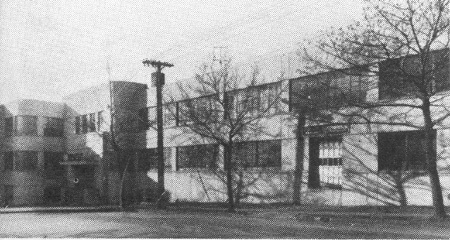 The latter people also communicated with parts manufacture such as Philips Machine and Metalware factories. Personnel beyond the above mentioned organisations and engaged in DP70 activities were J. Sliepenbeek, F. Rijke, H. de Laart, and others involved in the rushed DP70 planning. The group of cinemas equipped with the DP70 is very long and impressive. 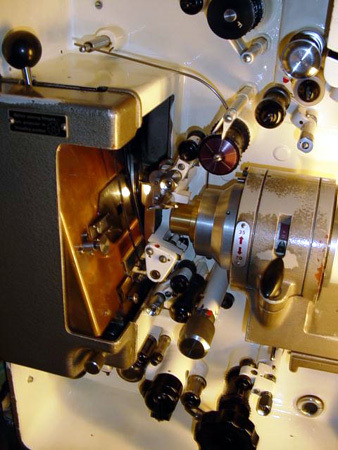 Many of the words most prestigious cinemas had the Rolls-Royce of 70mm projectors installed. Originally Philips Cinema kept very detailed lists of all cinemas with the DP70. The Philips company advertised the machine heavily in all major markets. The ELAgraph vol. 6 no 5 from November 1960 (110 cinemas in the States and 130 cinemas outside the States): Installations indicated with “*”. Norelco, the North American Philips Company, issued a list dated January 16, 1964: Installations indicated with “»”. Installations not mentioned in above mentioned official brochures or lists have no marking. Additionally, where available, I have noted how many projectors each cinema had, as well as information about screen size, number of seats, technical equipment, Cinerama & Cinemiracle and information about speakers, sound formats etc. For many cinemas the number of seats reflects how many seats the cinema had on the day of DP70 installation. Seating capacity information of early US cinemas is based on Motion Picture Almanac 1961 and Variety. Which is the longest running DP70? Most of the original cinemas does not exist any longer. They have either been rebuilt or demolished. If they still exists, it is unusual to find the DP70s still installed. In one case, however, that is possible. The Imperial Bio in Copenhagen, Denmark, had a pair (1644 and 1640) running until December 2011, when #1640 was scrapped on the spot to make room for a 4K digital projector. They had been running continuously since 1 November 1961. Surely a world record - 50 years of service. How many DP70 were made? How many DP70s were made? That is a question which I have been trying to answer for many years. It appears that there is no final record of the exact number of machines. I will never find out. Out of curiosity and to get an idea of the range of numbers I started to list serial numbers, cinema, city and country of each known machine. The list of machines which been located by friends and myself since 1982. Although every effort has been done to keep the list up-to-date, you must be prepared to find out that some machines have been removed. The machines have been located at one point since 1982 and may not be installed any longer. The list does not always reflect where the machines are today. Some projectors have been moved or scrapped since the date of recording. During this process I've come across some cases of double inventory. Even Philips made mistakes. There are two copies of the oak wood box for the spares and at least two #2171 out there. It could misreading of the plates. It is unknown how many DP70 projectors Philips Cinema manufactured from 1955 until the end, around 1966. Philips Lighting has been very helpful, but alas, have been unable to find the records. I doubt records like that exist today. Unfortunately I cannot give you any information about the production figures of the DP 70. You would have to turn to Philips Eindhoven in the Netherlands. The only thing I can tell you is a number of 1500 DP 70 projectors which we sold in the period from 1955 until 1968. I hope this will help you a little bit. The list of numbers starts off at #601 and ends with #2532 and then jumps to a final stop at #2729. There are no numbers above 999 and below 1300 (with one single exception: #1014). Kinoton in Germany, the distributor of spare parts for the DP70, have estimated the number of machines to be around 1500 units. From the beginning more than 50 years ago, the DP70 has been considered one of the best projectors ever made. Despite that, Philips continued to improve the machine until production ended around 1966. Since then, and especially in the 1990s, the DP70 is still being upgraded, by Kinoton and other private enterprises. This page will show some examples. Many thanks for your information about your interesting web site and special thanks for establishing a link to our web site kinoton.com. Regarding spare parts for the DP70 fortunately we cannot confirm your statement. It is true that not all service parts for the DP70 can be supplied, but most of them are still produced and supplied. 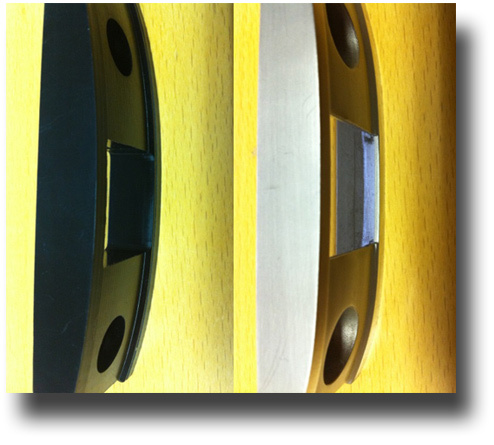 A reverse scan modification is available from Claco Equipment and Services (USA). It is based on the original soundhead/ stabilizer and is the only reverse scan modification that allows use of the no-contact sound drum as designed by Phillips. It also allows the use of DP70 machines with the Cyan Dye soundtracks. I did this reverse scan for the DP70 and can tell you that this photo was taken during the first test in Bioscoop Catharijne in Utrecht which was a success and I made another 4. Projector no. 1754 converted to the 870 format by Ciné Matériél in Paris, France. Note missing magnetic cluster and enlarged sprocket. Picture by Francois CARRIN. There are at least two examples of DP70's which have been converted to the 870 format. One 870 DP70 projector was offered at a price of USD 9995.00 dollars from Vistascope Corporation in Atlanta, Georgia, USA and another (SN: 1754) from Ciné Matériél in Paris. DP70 special reader bracket for mounting digital sound heads. Seen here are the DTS and Dolby readers. 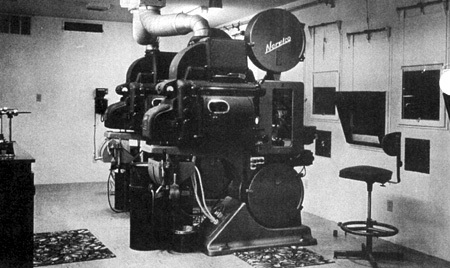 The Century Cinefocus system applied just slightly positive air pressure to the film from an outboard blower to keep it from rapidly fluttering when the heat from large arc lamps would hit the film. Newly developed photographic slit masks for the DP70 optical sound head enable the DP70 to faithfully reproduce audio up to 12.5 kHz at 0dB with little slit loss compensation added in the pre-amplifier stage. This is equivalent to a half-mil slit or less in a forward scan sound head. The original brass slits were expensive to manufacture; it was difficult to obtain clean and straight edges on the sides of the slit, so they were limited in their high-frequency output. Not only do the new photo slits capture the high-end frequencies of modern stereo optical sound tracks, they are inexpensive and easy to install. Photo mask by Todd-AO to boost the high end output to 0dB at 12.5K and -1dB at 16K. Rosbeek Techniek in Holland have made a new 35mm film gate for the DP70. This will also be available for 70mm. It is made of black Delrin. The old one is a little flat at the gate because the film should run as flat as possible through the gate. The lenses back than were not so good as the lenses these days to perform under a little difficult situation what the flat part of the film gate is because the film can hardly run flat over a most bended film gate.